1. Start with a smooth pony tail, high on the top of your head. Secure with an elastic hair band. 2. Take a small comb and tease or back comb small sections of your hair, working from the roots to the ends, to create fullness. 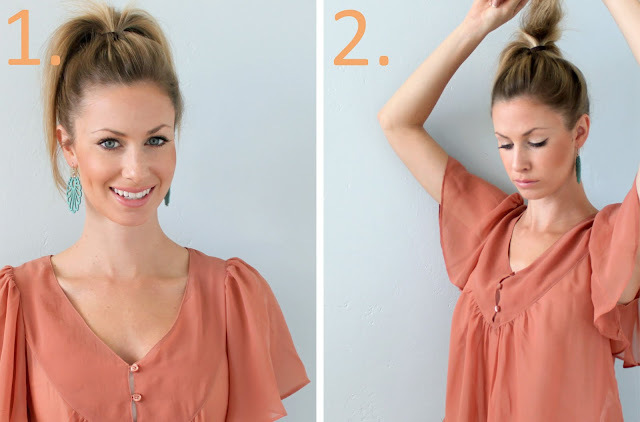 The point of a top knot is to have height. 3. Repeat step two until all of the ponytail hair has been teased. If you have time, you can also curl it with a curling iron. 4. If you want your pony tail to have some looseness, gently pull the hair around the pony tail holder loose, at the top, sides and back of head. 5. Gently brush the teased hair to smooth it out slightly. Make sure however, to not brush out the tease. 6. Gather the hair in the form of a bun and wrap the hair around your pony tail holder in a clockwise direction. You do not need to twist, just wrap. 7. You can adjust the top knot for width and volume here. Secure with several bobby pins at the base to keep the bun in place. 8. Throw some hair spray in there and you've got your bun, hun! I like to top it off with a cute pair of earrings to draw attention to your face. This is one of my favorite and go-to hairdos. Love it! I love this look and wear it all of the time...my boss always looks at me funny when I do though and then tells me I have Utah hair? What? I don't even live in Utah...anymore anyway. very cute, love this look and I use it all the time, so easy and quick! great little tutorial! This is stunning on you and I cannot wait for my hair to be long enough so I can pull it off! I'm actually wearing my hair like that today. I wore it like that yesterday as well. Love it! cute cant wait to try! Love this tutorial! Going to try it today! I love the top knot. It's so simple yet chic. great tutorial! i have been wanting to try this, but you spelled it out wonderfully. thanks! your so cute!! love this. Great tutorial! Thanks for sharing! Love your blouse! Thanks so much! Your tutorials are always so good! cute and i love that top! I love the hair and your blouse! I love this! I am definitely going to bookmark this and try it out once my hair *finally* grows out. I love this post! thanks for sharing :) I am going to try this out! Great how to- post! Thanks for sharing! Greatest DIY ever! I have to try this asap. Have a great weekend. you look so different than you used to - but it's good either way! the brunette looks good. Did you get a tiny nose job? If so, it's a good one. Love your blouse!!! Wheres it from? Though I think my brush would get stuck in my curls if I tried this, You look gorgeous and I love this look. My hair might still be a little too short for that! But love the look of it! I just found your blog and I love it! You are so beautiful and I love your style. Can't wait to keep reading. Thanks for posting this! Can't wait to try it! i adore your earrings!! 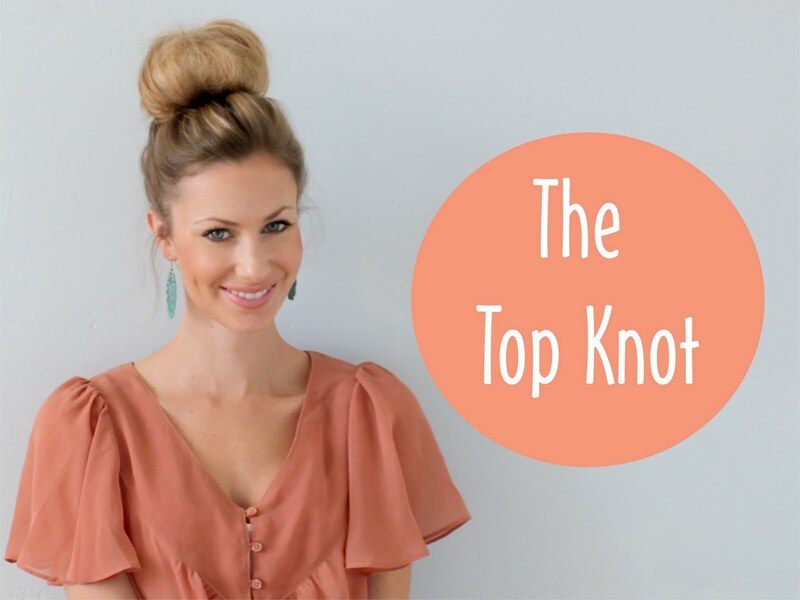 and i have tried this topknot before, i need to do it again, it's so easy and versatile, so cute! Sorry I'm commenting like crazy, but just tried this and it's so quick and easy and super cute! Thanks girl! dammit, why did i just cut my hair?! ah. thanks so much for this! totally doing it tomorrow! your newest follower from the Creatives FB group. u r gorgeous! found your awesome blog through the facebook creatives group. and am your newest follower! just found your blog. First off, you are absolutely gorgeous. Second, I love your blog! I love this hair style, and want to do it for my wedding next year. But i have short hair and don't know if it'll grow out long enough to do something like this. Do you have any suggestions? Would extensions be something I should look into?? I love that picture with your teased ponytail, haha! Great tutorial, and you are gorgeous!! 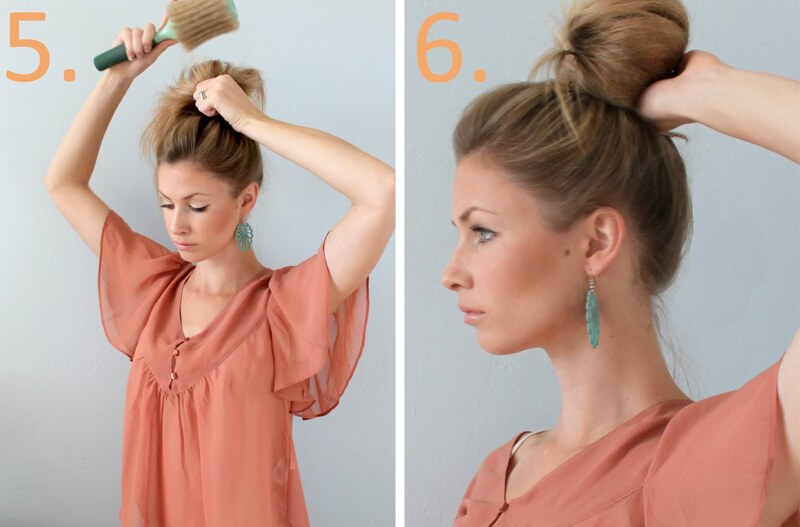 OMG, just found this and I literally just tried a top knot. I've NEVER been able to do it before. Great tutorial! I love this post, an adorably cute hairdo that can be worn dressy or casual. Great tutorial! I guess everyone does the top knot differently. When I first wore the knot, I didn't put it in a pony first. I put it in a pony last. Your way might be easier. It's Gorgeous! It's so easy to do, and natural looking! So many thanks, I became just browsing in some places but got to learn this post. شركة بيتى هى شركة مكافحة حشرات بمكة لدينا العمالة المدربة التى تقوم بخدمات مكافحة الحشرات بأستخدام اجود انواع المبيدات المستوردة الالمانية والامريكية التى تقضى على جميع الحشرات بمكة كالصراصير بمكة وبق الفراش والعته والقوارض بمكة والثعابين بمكة والعقارب بمكة والوزغ بمكة والفئران بمكة والنمل الابيض بمكة كما اننا نستخدم اجود انواع المبيدات التى لا تسبب الروائح الكريهة ولا تضر بالبيئة ولا تضر بصحة الانسان وجميع خدماتنا نقدمها بأسعار رخيصة فى متناول الجميع . نقدم لكم باقة من افضل الشركات المتخصصة فى مجال كشف تسربات المياه فى المملكة العربية السعودية خدمة متميزة بأسعار رخيصة وبضمان 6 شهور حيث نقوم فى شركة سيرفس تاون باستخدام أفضل أجهزة الكشف عن تسريبات المياه بدون تكسير للحوائط والجدران ونقوم بالكشف عن تسربات الخزانات والاسطح والمسابح والمطابخ والحمامات من خلال أفضل العمالة المدربة على أعلى مستوى من الخبرة. اذا كنت تريد نظافة مثالية وجميلة وكنت تريد اعادة بريق شقتك وفلتك الى اروع منظر ولاتريد ان تشعر بالحرج اما ضيوفك عليك أفضل شركة تنظيف بالطائف شركة سيرفس تاون أفضل شركة متخصصة فى مجال التنظيف المنزليى بجميع انواعه من تنظيف شقق بالطائف - تنظيف فلل بالطائف - تنظيف مؤسسات ومكاتب بالطائف - أفضل شركات التنظيف فى الطائف لاننا نملك فريق مدرب على أعلى مستوى من الخبرة والكفاءة فى تنظيف وغسيل البيوت والعمائر. بق الفراش من الحشرات المؤذية لأنها تسبب قلة نوم فبق الفراش هو حشرة صغيرة مسطحه قادرة على التواجد في المكان الذي يعيش فيه الإنسان ويتغذى على امتصاص الدم ويتواجد في الفراش قليل التهوية وأسرة الفنادق ، وفي المناطق الحارة والحيوانات الأليفة وينشط البقُ ليلا ويختبئ نهاراً وقد يكون من الصعب التخلص منه لكن أفضل طريقة لعلاجه هي الحصول على مساعدة مهنية والاتصال بشركة مكافحة بق الفراش بالإحساء بحيث يبحث التقني ليتأكد من وجودها ويمكن أن يستعمل بعد ذلك علاجات خاصة مثل المبيدات الحشرية أو نظام تجميد سريع للتخلص من بق الفراش بأنواعه نهائياً لذا يجب أن تتواصل مع شركة مكافحة بق الفراش بالإحساء فوراً.